No matter what, Jay Bilas in cowboy gear is a winning visual. 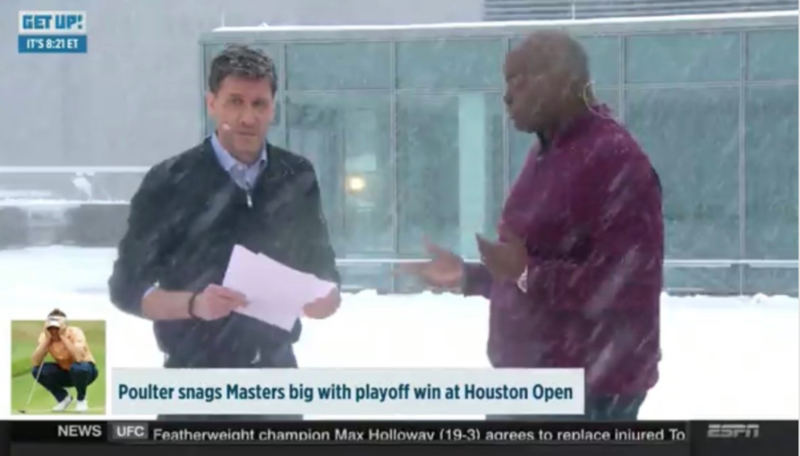 After more than a year of rumors, anticipation and speculation (along with a four-month delay), Get Up finally made its debut Monday morning on ESPN. Get Up tried to have it both ways with that opening, however, with Mike Greenberg and Michelle Beadle expressing disbelief that ESPN would place such blockbuster expectations on their show. Jalen Rose embraced the comparison for an amusing contrast. But some might roll their eyes at even the implication that Greenberg, Beadle and Rose are some kind of sports broadcasting Avengers. Those convinced that Get Up would show off a liberal slant might have been surprised when the show didn’t begin with a discussion of Donald Trump and DACA or that the regular trio of hosts was joined by Booger McFarland, rather than Bernie Sanders. Maybe the watchdogs still found some affirmation in the show beginning with women’s basketball. But come on — a buzzer-beating shot to win the national championship? That’s what Notre Dame and Arike Ogunbowale gave us in their victory over Mississippi State Sunday night. Get Up was absolutely right to lead off with that as its top story of the morning. To do otherwise would have been ignoring the all-too-obvious and probably made the show look scripted, as if they had decided what they would begin the show with days ago. 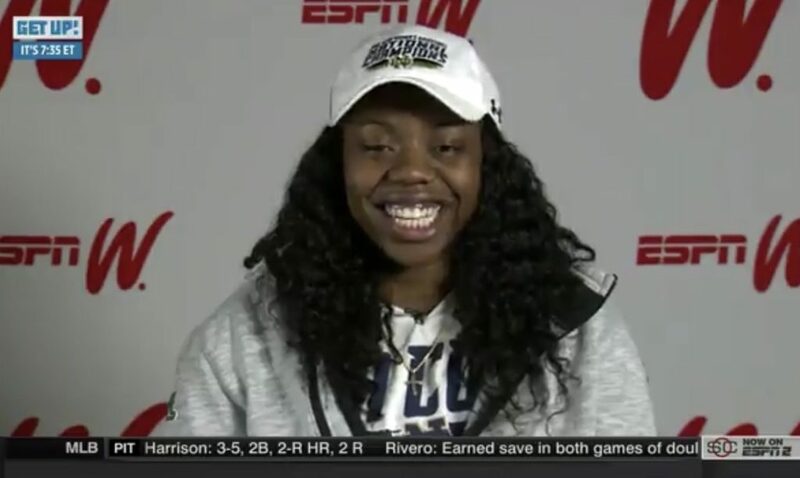 Later in the show, Fighting Irish guard Arike Ogunbowale was interviewed, No one had a better weekend, hitting two last-second shots in Notre Dame’s last two games to slay the giant UConn and win a national championship, respectively. A whip-around highlights segment titled “Get Up and Go” quickly followed, which provides a good way to catch up on the previous night’s action, fill viewers in on what they may have missed, and fills the need that most of us used to fill by watching SportsCenter first thing in the morning. ESPN surely hopes you’ll watch more of the show during your morning routine, but if you only watched “Get Up and Go,” you’d have some quick-hit watercooler material to take into your day. The segment also allowed Get Up to show each of the in-studio personalities as they chimed in on particular developments and storylines. Yes, they went quad box! The show definitely kept things moving in its first hour — maybe a bit too much. Every morning show — whether news or sports-related — has plenty to talk about and doesn’t dwell too much on a particular topic, but some subjects warrant some breathing room and a bit more conversation. (A pre-taped feature or two might help the pace too.) That’s often where the chemistry between hosts demonstrates itself best, as on NFL Network’s Good Morning Football or MSNBC’s Morning Joe. Get Up wasn’t going to be in that place on its very first show. It would have been truly impressive if that happened. However, it’s going to take some time for Greenberg, Beadle, Rose and McFarland (along with anyone else who happens to join the hosts in studio) to develop that kind of rapport and comfort level. Whether or not they do could determine how successful the show is. But that’s not going to happen on day one and it shouldn’t be expected. The highlight of the show presented itself very early on with Get Up‘s first-ever guest, college basketball analyst Jay Bilas. Discussing Monday’s national championship game, Bilas brought some San Antonio with him for his interview for some strong television. Bilas might want to consider making that ensemble his regular outfit for TV work. He could be the Jim Ross of college basketball for ESPN. The interview was a good one, especially when Bilas mentioned changes that he thought would be coming to the sport, such as a deeper three-point line and a wider lane. Yet college basketball may have also resulted in the most annoying part of Monday’s first show. Yes, we knew former Michigan star Jalen Rose was going to show his support for the Wolverines going into the national championship game. We also knew Get Up‘s debut would prevent Rose from being in San Antonio on Monday. But acting as if he was personally offended every time a guest — like Bilas, fellow ESPN analyst Jay Williams, or Charles Barkley, who called in) — picked Villanova to beat Michigan got old really fast. And I say that as a Michigan (and Rose) fan. (I think the Wildcats are going to win too, Jalen.) He’ll get to brag plenty on Tuesday if the maize-and-blue pull off the upset, and should have left it at that. But anticipating hot takes doesn’t really make for great TV. At least it didn’t in this first attempt. (Wolff should have gone meta and imagined a scathing review of Get Up as a hot take.) Eventually, maybe debating the temperature level of certain takes will lead to some good discussion and debate. But for now, it feels like an attempt to undercut possible criticism before it can be leveled. Again, a good chunk of ESPN’s daytime programming is based on hot takes, so is Get Up going to make fun of shows like First Take, Around the Horn and Pardon the Interruption? If so, the segment will probably benefit from taking it to the extreme and getting ridiculous. Make it fun. Otherwise, this looks like the first change that producers could make after some self-evaluation and feedback from the audience. Get Up has a steep uphill climb ahead of it because it’s trying to compete in rather ferocious territory. Morning shows are big business for broadcast and cable networks now. ESPN might feel that their new morning show can eventually overtake rivals like Good Morning Football, MLB Central and radio show simulcasts. It probably can be a big fish in a little pond. But it doesn’t feel like that’s the goal. Can this be an alternative for viewers who like to watch Today, Good Morning America, Fox and Friends, New Day and Morning Joe? Get Up will never overtake those shows. For people who don’t want politics, deadly serious news, or lifestyle programming (after 8 a.m.) — especially those who are sports fans and either want some commentary and analysis about the previous night’s action or some discussion of what’s to come — it’s possible that this is a show they could eventually have on during the morning. It could play at the gym, hotel lobbies, airports and waiting rooms too. However, expecting Get Up to be all of that on its very first day is unfair. Some viewers may never watch again based on what they saw Monday. (And maybe they were ready to hate this, regardless.) Others might think it was OK, but not enough to compel a change in routine. But once this crew settles in, producers figure out what works, and maybe the overall show slows down just a bit and doesn’t try too hard, a comfort level could develop. That’s probably worth checking back in on.